While attending any event, it’s easy to think, “I could have coordinated this so much better!” We have all been to some motor sports event, and wondered; “Why did the event planner organize the event this way?” However, have you ever really stopped and thought about what actually goes on behind the scenes of a race or event? This summer 2012, I did just that. I was given the honor of being able to travel all over the U.S. with the organizers and hosts of the W.E. Rock, aka World Extreme Rock Crawling events. With the recent excitement towards the Ultra-4 racing, and advancements of the sport, W.E. Rock decided to add a new event to their season. Dirt Riots are their newest venture and get the drivers not only thinking about how to manage the course, but how to do it in the fastest time as well. It is not a race to the finish line, but an endurance race, and the one who manages to make it through as many laps as possible in 3 hours, wins this new style of racing. Rich “Big Rich” Klein, the largest promoter in the nation, was able to give us a distinct insight into what goes into the actual coordination of these large events. He became a promoter by volunteering in Utah to help other promoters at different events, and learned what worked and what didn’t. Upon moving back to California from Utah, he saw a need for regional events to take place in both California and Nevada. After watching the Warn Nationals and the first year of the ARCA series, he decided to begin hosting his own events and began by speaking to local wheelers in Northern California to see what sort of interest was out there. As Big Rich explains it, “I found a piece of suitable property for an event and jumped in with both feet. This was the beginning of Cal Rocs. Just prior to November 2000, Big Rich used his organizing skills to help his 4×4 club set up their annual four-day trail ride. Shortly after, he hosted his first off-road event, Put up or Shut Up!, a “run what you brung” event hosted in Amador County, California. Through their travels, the crew gets to have numerous experiences. Shelley, Big Rich’s wife, has the unique opportunity to blog about the crews new adventures on her two blogs, www.fiftyin365.com and www.trippintheamericas.com, which Big Rich says, “keeps her writing and all of us looking for new and different things to try and to see.” Shelley is also a key part of the crew, as she helps to keep Big Rich focused and grounded. Aside from taking care of the administrative side of the organization, such as paperwork, insurance, registration, and any other logistical work, she also makes sure the guys are fed and that the teams money is balanced. If you ever get the opportunity to try Shelley’s Fish Taco’s, do not pass, because you will never find a better Fish Taco. Josh England is also an integral part of the crew’s team. Working independently for Rise Above Photography, Josh works and travels with Big Rich and Shelley full-time during the rock-crawling season. Big Rich genuinely expresses that “[Josh] is the right hand and muscle behind WE Rock. Josh brings humor and craziness to our wild days. [He is also] the kind of guy who helps everyone and works until the job is done.” Josh’s role in the team is mainly course design, deciding where it is necessary to have obstacles for rock crawling, and marking out courses for races. He also serves as a liaison for the drivers and does a great job of it. After each event, you will find Josh taking the time to talk with all of the drivers and teams about the event. He does not do this because he has too; Josh cares about every team that competes with WE Rock, and if there is an issue, he will do everything in his power to help resolve the issue. Charlene Bower at Bower Media Motorsports is also a key partner in making sure that the digital side of event promotions is taken care of. She organizes all of the events media representation. She insures that there is a constant updating of Facebook and Instagram campaigns, while also keeping the events website up to date and active. Big Rich’s role in the team is to interact with the competitors, marketing partners, property partners, as well as the volunteers. He is truly in this business, purely for the love of the racers, the events, and to make sure everyone gets what they need out of their series. While speaking with him, he made it very apparent that this is not about the money or the glory, but just for the love of the sport and the community. Early in his career he was invited to be on a forum at Off-Road Expo with some big names in the business, Rod Hall, Bruce Hubbley and others, he relates that as he sat there and looked around he really didn’t know why he had been invited, he felt like a very small fish in a small pond and was humbled by the experience of being with some of the greats in the business. Though Big Rich, Josh and Shelley keep things running, these events wouldn’t be possible with out numerous volunteers. Big Rich explains that, “volunteers are a mainstay, without them, we are sunk. They take the load off our full-time staff, and cover pieces and parts we could never begin to without them. We use them as course workers, judges, recovery, and any thing else we can think of. They are our life-blood.” The team relies so much on their volunteers, mainly because they arrive on site on a Tuesday, take a few days to set up the course, have registration by Friday, and a tear down immediately following the race, ensuring they are back on the road by the following Monday. This routine and the number of volunteers they rely on, allows the team to make it to their next event with plenty of time to begin the process over again, in the next event location, sometimes thousands of miles away from one another. Even though the team plays an integral part in organizing the event, other factors play huge roles as well. Things like weather, travel time between event sites, and other events affecting attendance of drivers or spectators are all taken into consideration. 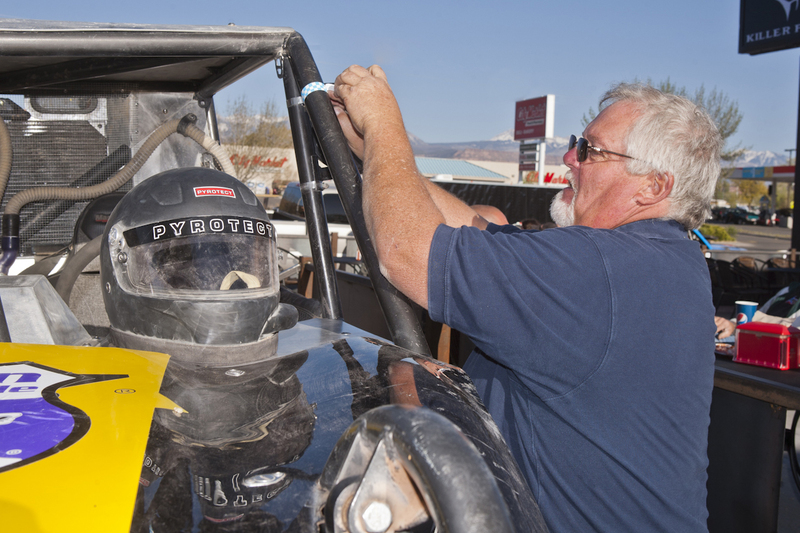 The Ultra4 schedule, property conflicts and many other things are also evaluated. Sites are scouted out a year in advance. Over the course of the year, landowner agreements are settled and signed, marketing research and promotions are coordinated and then a week before the event, insurance is taken out for the event. When deciding on where the event will take place, Big Rich tries to avoid federal lands, making private property and municipal properties easier for the design of the event. Federal properties tend to be more difficult to work on. Big Rich explained that, “BLM has instituted a policy called cost-recovery that is monitored only by that local office, thus giving them the ability to charge enormous fees that are cost-prohibitive for event promoters. We have had good success working with city and county governments where there is a local government that is influenced by the local community.” It is difficult however with any property, because the landowner is in charge of marketing the event locally. There is no way for Big Rich to know if the land owner has properly distributed the provided promotional material, until he is on site, which is usually only a few days before the event. It is also a challenge because not all private lands are suitable for these races. Big Rich has to analyze a number of different qualities, for different properties, to ensure a good location. When looking for new areas, the terrain, access for the Taj Mahauler (W.E. Rock semi truck), and the distance from a potential spectator base, are all taken into account. It is also important that the area is centrally located for drivers, cooperation and interest from property partners is available, that there is a strong local support for promotion, and that the weather and temperature are going to be ideal. Spectator parking and viewing areas are also heavily considered, as W.E. Rock is the most spectator friendly event in our industry. Marketing Partners are also incredibly important to the survival of these events. Big Rich and his team make an effort to build strong partnerships so that the team can build events not only around driver’s needs, but their marketing partner’s needs as well. The strong relationships Big Rich has created with some of these important partners, shows that they see value in what these races have to offer and many of them have been supporting the W.E. Rock team for years. It is really exciting to see the popularity of these sports growing, which is apparent because Superchips signed on as a title sponsor for the final two events of the 2012 season. This is interesting because their company is not directly related to off-roading sports. Their interest shows the growth of the sport, even into companies that are not necessarily part of the industry. While winning is a key part of any race, playing by the rules is important as well. The rulebook also plays a part in keeping the drivers coming back year after year. It constantly evolves and when a problem arises, Big Rich determines if it warrants a new rule or if it was a one-time incident. 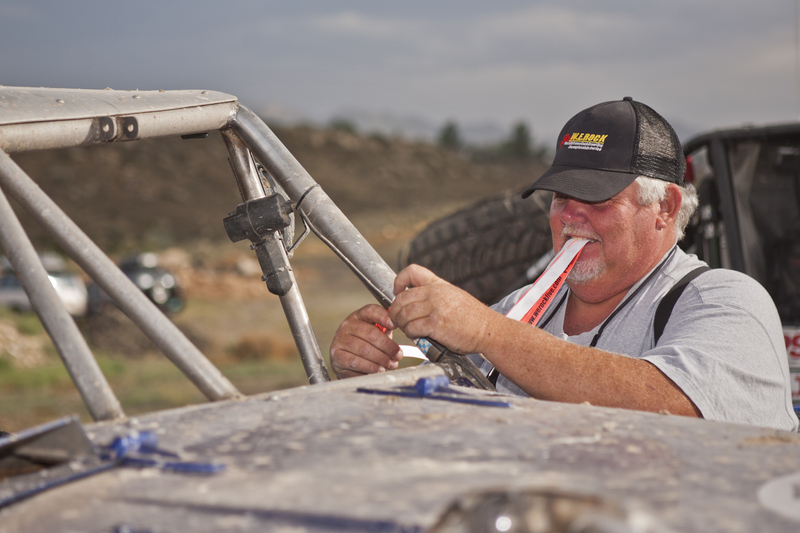 His dynamic way of ensuring the legality of the races is the reason why his rulebook has become the standard of Rock Crawling competitions. Big Rich said one of the best rules he ever implemented was allowing drivers to contest judgment or call another driver out for breaking a rule. There is a catch though; contesting or “calling out,” requires a collateral of 100 dollars. If you’re found to have been correct in your call, you keep your money, if the accused party is found to be innocent they are given the money. This system has proved to keep everyone honest. Safety regulations have also evolved over time, requiring drivers to now have DOT Helmuts, DOM Roll cages, fire extinguishers and other advancements in racing safety. New safety rules implementing that spotters may not touch tires while tires are in motion or throw rocks while tires are in motion, help to ensure the safety of all participants and spectators. With Dirt Riots gaining so much popularity, it is expected that the 2013 events will double in size. It is also expected to see more professionals competing and the Trail and UTV classes expanding over the next year. The hope is that having more drivers and more interest, will help to create separate classes, that will be able to run all of the four races. The W.E. Rock team is always looking for more volunteers to help with their event coordination. There is no specific requirement or talent needed to volunteer, but an active interest is required. Big Rich describes the volunteer’s perks as being able to “have the best seat in the house. [Volunteers] are close to the action and very much appreciated. We love our volunteers, they get free admission, a t-shirt and at most locations, lunch.” If you would like to volunteer for any of these events, it’s easy to sign up. E-mail Big Rich at bigrich@werocklive.com to let him know of your interest and which location you would like to help out at. It’s that easy and you get to be a part of the events coordination. What does it take to put on a W.E. Rock event? The photos tell it all!